Has Video Refereeing Ruined The World Cup? 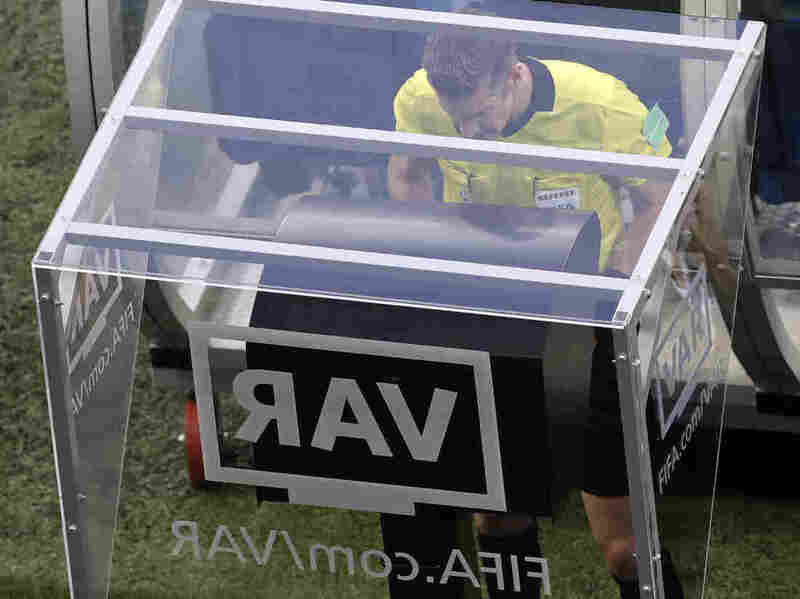 This is the first time the World Cup has used video replay to make official calls. Some say it has made for a cleaner game, but soccer purists claim it's ruined the event. In a June 22 World Cup Match in St. Petersburg, Russia, Costa Rica's Giancarlo Gonzalez fouls Brazil's Neymar (in blue at left), but the penalty was rescinded after Video Assistant Referee review. Brazil went on to win 2-0. Tensions were high at a crowded bar in New York City, packed with sweating Belgian and French fans. A lot was at stake: Whoever won Tuesday's game would go on to play in the World Cup final. Anxious fans booed, chanted and yelled at the screen. As raucous as soccer can get, it's also a game of charades. Players communicate with the referee, who often speaks a different language, by using sign language. A striker will hold up an invisible infraction card to ask that an opponent be penalized; the ref might point at his eyes to acknowledge a misbehaving player. And this year, a new gesture has been added to the lexicon: a box drawn in the air, which means, "Let's check the video replay." This is the first time FIFA, soccer's governing body, has allowed video replay to be used to make penalty calls in a World Cup. And while fans of basketball and American football are used to the referees stopping the game to consult video footage, soccer purists say it's ruining everything. The major complaint is that it's making the matches much longer than the typical 90-minute games. Martin Rogers, a sports columnist for USA Today, says Video Assistant Referee (or VAR) is "slow, clunky and unpredictable." Over the phone from Russia, where he's reporting on the World Cup, he jokes, "I remember back in the day, when if a game kicked off at 3 o'clock in the afternoon, you'd be all wrapped up by 4:45." Rogers says this type of technology works well for American football and basketball. "When you look at the calls that are used for replay, in basketball for example, it's normally factual. It's based on, 'Did a player get a shot off before the clock expired?' It's easy. You know. It's black and white." But soccer, Rogers says, is different. He's referring to one of the most hated and beloved qualities of the game: the endless drama. It's a thespian sport. Take a player like Brazil's Neymar, the Meryl Streep of soccer. He dives spectacularly when a player merely brushes him, and agonizes for minutes on the ground hoping to get the ref to call a foul on the opposing team. Referee Matt Conger watches the Video Assistant Referee system during the World Cup match between Nigeria and Iceland in Volgograd, Russia, on June 22. Rogers says with performances like that, a human referee is more effective than video. "You can see that there's been contact," he says. "But the video doesn't show how hard that contact is, especially in slow motion. So it's really, really difficult to tell." Some might argue that those Oscar-worthy performances are precisely the reason VAR is needed. Take the case of the Brazil-Costa Rica game last month. 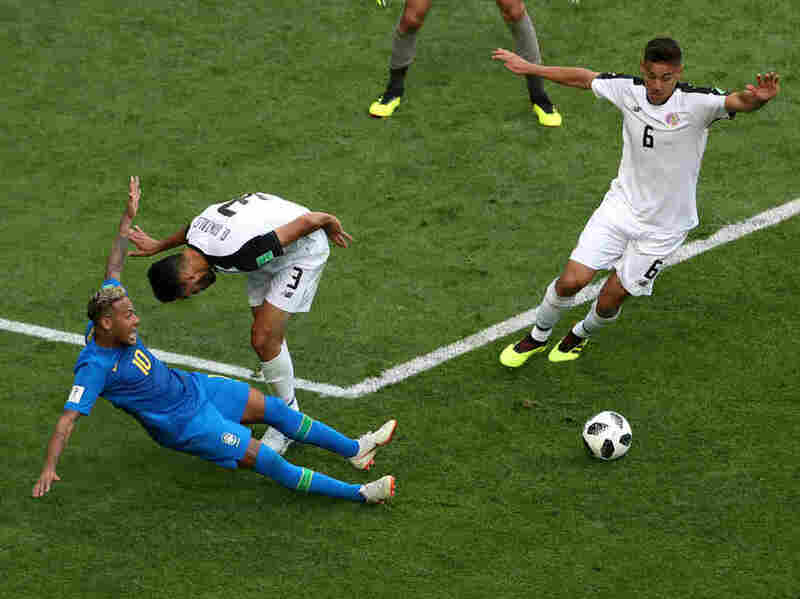 With just 12 minutes remaining in a scoreless match, Neymar fell dramatically on the ground, claiming he'd been fouled. The ref granted a penalty but decided to double check with VAR. The footage showed a different story: Neymar had practically fallen all by himself. The penalty was overturned with the help of video footage. FIFA says video reviews are "close to perfection." That's a shift from some of the egregious wrong calls made in soccer games in the last decade or so, mistakes that went viral on social media. Chris Bowerbank, host of the Premier League podcast Across the Pond, says it was just a matter of time before video technology was incorporated into the game. Bowerbank himself was initially on the fence about video replay. But he thinks it may have had a positive impact on this World Cup: Players are behaving better. "There've been zero foul-play or violent red cards in this World Cup. And part of it might be that, you know, there is a camera on people now at all times," he says. Back at the crowded pub in Manhattan, the end is near. France is winning, 1-0. It's been a cautious game, and the referee never once consults with VAR. The match wraps up: France is heading to the finals. Dejected Belgians exit the bar, weaving through rowdy, celebrating French fans. Outside, I run into Kenneth Coremans, from Belgium, smoking a cigarette with his friend. He's been crying. I ask him if using video replay would have helped Belgium. "Yes. Yes. Definitely," he responds, deflated. He says that if only the referee had seen the footage, he'd have called at least one of the fouls against Belgium, giving them an opening to win. As he explains this to me, two French fans walk by and taunt him. That's the thing about soccer, it can be really cruel. And using this new technology can be annoying — until you need it on your side.